As the revamp and rebirth of Google Plus continues, another update has been made to the site to improve the user experience. News of the update came from Luke Wroblewski, a Googler who is working on the project and follows up an announcement he made earlier in the week around the Android app update for the social & community site. 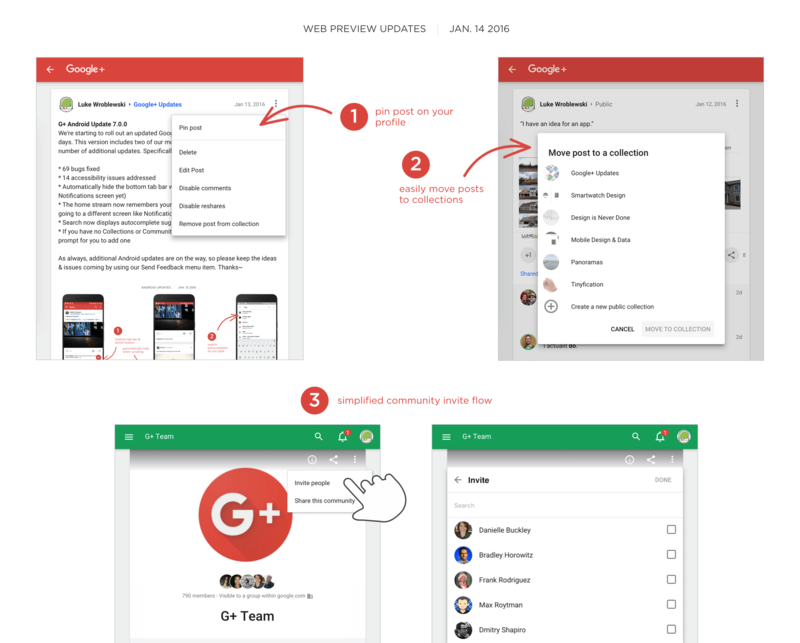 The updates to Google Plus that Luke announced includes 37 bug fixes but also some streamlined features and added features. For example, you can now pin posts to your Profile and the update brings an easy way to move your posts into a Collection. Lastly, there is an improved and simpler invite to a Community feature in the update. Because the update is all on the back-end, they will simply appear when you visit the site. Generally these roll outs happen pretty quick – a day or two – so you likely will see it this morning. As usual, Luke also posted an infographic of sorts on the changes and improvements that are in this update. You can find that to the right. I should point out that technically these updates to the site and the new app are still considered to be in beta (in fact, you can go to the old site it you want) so you could still find a bug or two as you use it. That said, the improvements made to the site over the past few weeks have been really good and behavior is far more predictable and stable now than it was when they first rolled out the update. If you run into a bug of some type, be sure to use the Feedback feature to let the Google team know.